You can download the new tool here. Please note, this is based on the undocumented API used by the formula tool so while it works in 11.0 there are no promises of it working in the future versions (and it doesn’t work in older versions). I plan to document up all the workings of this in a later post as well as how I put this together. Match – evaluates to True / False in a new field. Supports Error if not matched. The remaining methods, Split to Columns and Parse, will be implemented in a later update. In addition, I wanted to have syntax colouring on the Regular Expression. The formula tool uses CodeMirror behind the scenes, so it felt in keeping to use it as well. Combined with some great work Douglas Duteil, there is a gist with the code for adding syntax colouring to Regular Expressions. Run Install.ps1 (right click and select Run with PowerShell). 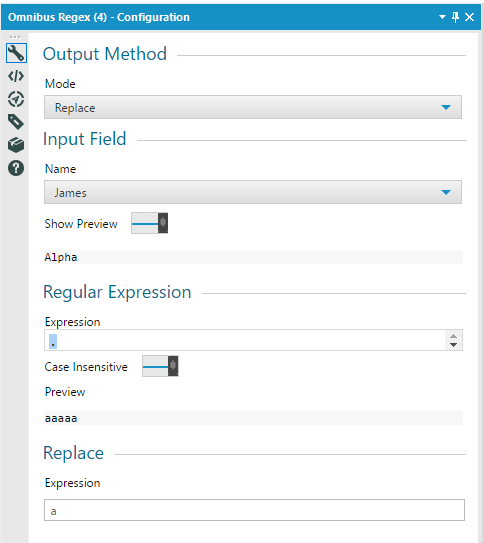 This will add a junction (symbolic link) into the HTML plug ins folder of both Admin and User Installs of Alteryx after which the new Omnibus Regex tool will be available within Parse. If you want to uninstall the plugin, then run Uninstall.ps1 it will remove the link(s). The source code of it all is here. 11-Mar-2017 in alteryx, Beyond Alteryx Macros, Coding.